This was the first headlining tour for the Chicks. Originally scheduled to end in October, 15 dates were added to take it into December. The Chicks used an end stage setup. Between the opening act and the Chicks coming on stage, fans were given a chance to win upgrades to the front row with various activities while a helium filled fly blimp circled the arena, often times dropping guitar picks. The curtain was made to look like a pair of blue jeans and as Lenny Kravitz's "Fly Away" finished playing, the zipper opened and the curtain dropped to start the show. During the mid point of the concert, the Chicks showed a slide show of embarrassing childhood photos while they provided commentary making fun of themselves. 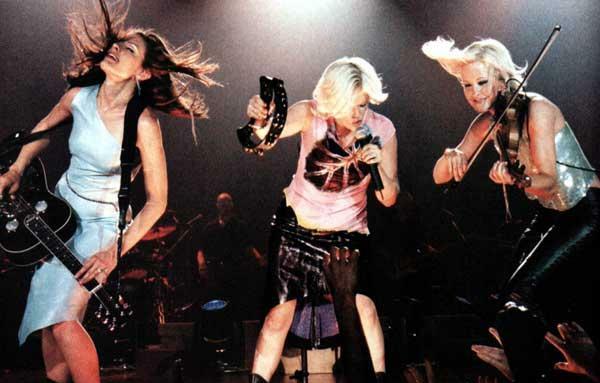 For the encore, Martie and Emily were transported to the upper sections of the arenas to play for the fans in the cheap seats while Natalie moved to the back of the arena floor. Opening acts included Patty Griffin, Willie Nelson, Ricky Skaggs, Vida and Joe Ely. This was the basic setlist at the outset of the tour. Some songs were changed or omitted at certain points during the tour. Loving Arms, Truth No. 2, Am I The Only One Who's Ever Felt This Way, and Merry Christmas From The Family were played at some of the added dates at the end of the tour.